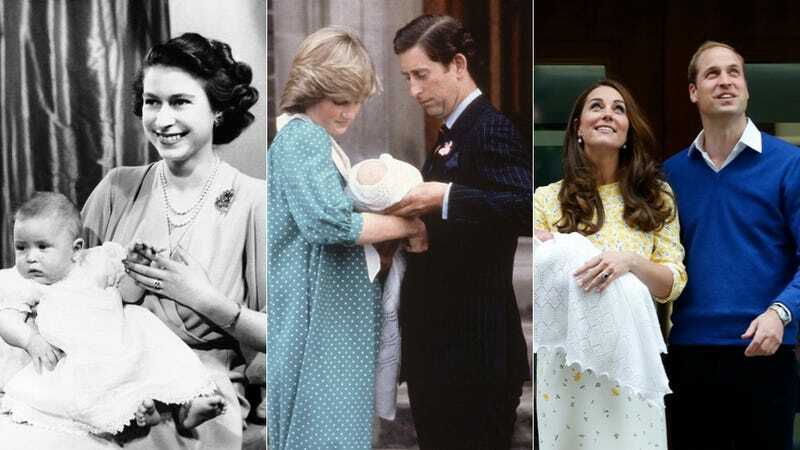 On Saturday, another human being joined the centuries-long line of succession to the British royal family. This new Windsor was of course greeted with a commotion in the American media—but there’s nothing new about that. From the moment when the pealing bells throughout the kingdom give joyful tidings of the happy nuptials of Kingly Darby and Queenly Joan, the thoughts of every loyal subject fondly turn to the expected Royal Baby. The weal or woe of the superb parents is a matter of small consequence. The object of that glittering pageant is a Royal Baby. Of course, the events of World War I would sweep away much of the sense of consequence in these earlier royal baby reports. But they couldn’t kill royal baby reporting itself. Of course, the birth of Prince Charles in 1948 inspired quite a flurry of coverage. He was the Prince George of his day, after all, and the American press went positively bonkers over him. The surprise of his first sight of Anne was soon lost in the pleasure of being able to see so much of his mother. Until then Elizabeth had usually been so busy with public duties that Charles saw her for only an hour a day. Now she was in bed and always accessible. His father was around too, back from his naval station in the Middle East and was always good for a game or a chat about engines and boats. But of course it was the tail-end of the 1950s, and I guess America loved praising women for having babies even more than usual. My very favorite coverage comes from a wire service’s man in London, who wrote a piece syndicated in a Texas newspaper with the headline: “New Heir Means New Respect for Queen Elizabeth.” Gag me with a spoon. Oh, and a word of caution to anybody considering putting money on any particular name: The bookies blew it in 1982. Sorry, kiddo. It’s rough out here for a spare.